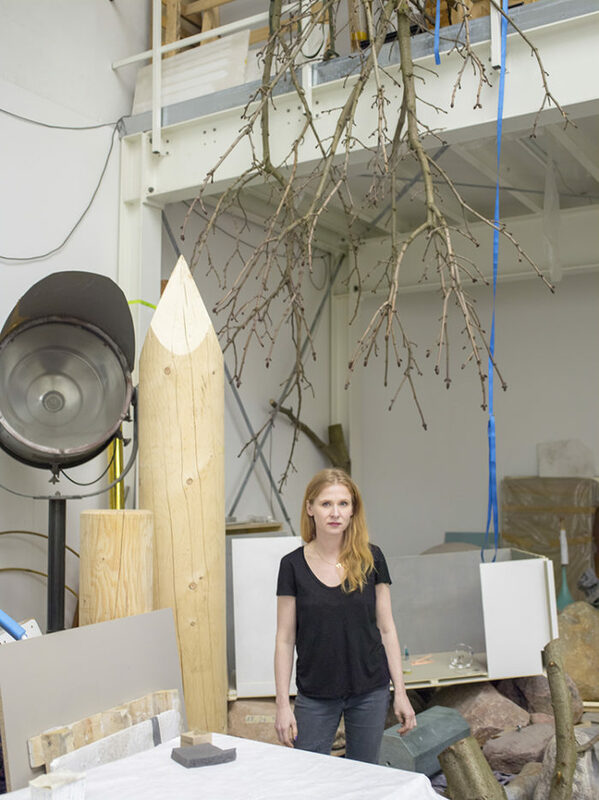 Alicja Kwade in her Weissensee studio in Berlin, 2018. 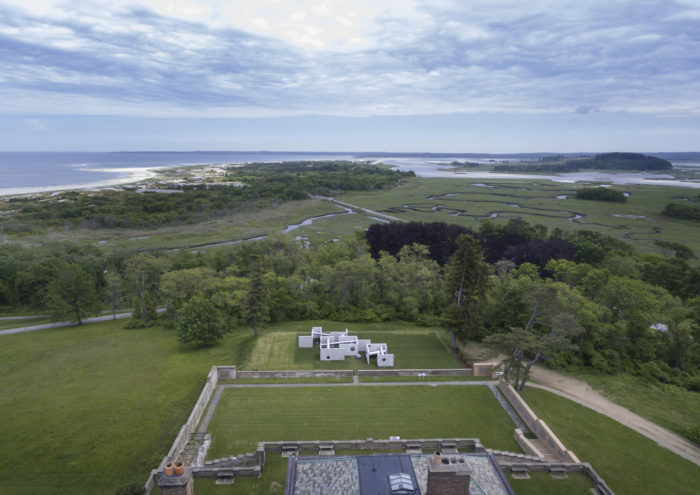 Kwade was in Massachusetts for the opening of TunnelTeller, an installation on the grounds of Castle Hill on the Crane Estate as part of Art & The Landscape, a relatively new outdoor public art program initiated by the conservation and preservation organization The Trustees of Reservations. Her skepticism was in high relief that day, as the setting was well, pretty unbelievable. Purchased in 1910 as a summer residence by the Chicago industrialist and plumbing magnate Richard Teller Crane, Jr. and donated by the family to The Trustees in 1949, the now 2,100-acre estate includes a 59-room Stuart-style mansion, an Italian garden and a half-mile long swath of impossibly green lawn that undulates roller coaster-like down to the sea. “This nature is so intense—and also this is not real,” Kwade says, gesturing to the storybook house looming above us. 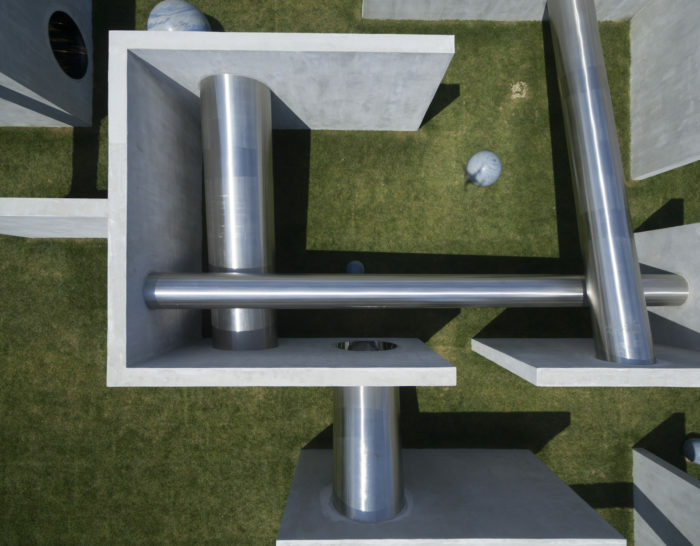 Alicja Kwade’s TunnelTeller, 2018. © Alicja Kwade, courtesy of Peter Vanderwarker Photography. Installed where a hedge maze used to sit, just beyond the terrace of the great house, TunnelTeller is a maze in its own right. Fabricated from smooth concrete, it is punctuated with gleaming stainless steel-lined apertures of various sizes that frame and distort your view— and ultimately your perception—of the surrounding landscape. Spheres cut from macaubas, a Brazilian quartzite, are strewn about like marbles left by a very large and careless child. “It’s very against logic that a stone has the color of the sky,” Kwade observes. Interior view of TunnelTeller, 2018. © Alicja Kwade, courtesy of Peter Vanderwarker Photography. I first encountered Kwade’s work in 2013 during Berlin Gallery Weekend. Her piece Nach Osten was installed in the nave of St. Agnes, a massive brutalist church which had just been acquired by the gallerist Johann König. Inspired by Foucault’s pendulum, Nach Osten consisted of a bare light bulb, strung nearly 15 meters from the ceiling above, that swung through the otherwise pitch-dark space with an audible whoosh, at an axis calibrated against the earth’s eastern rotation. 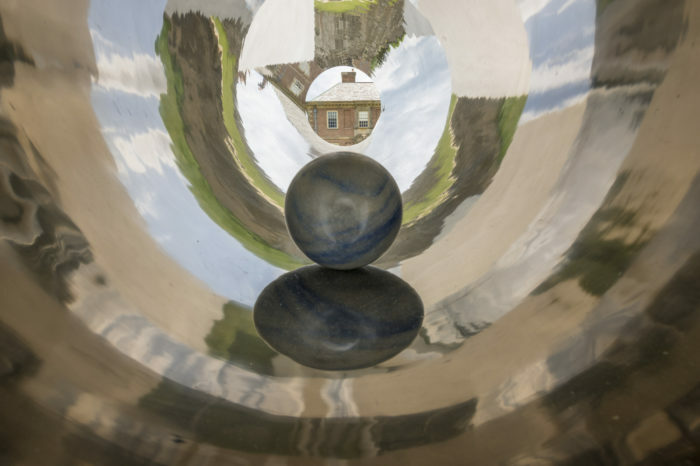 Even without any knowledge of the science behind it—or, for that matter, of the artist who made it—the piece struck me as elegant and quietly profound. The most effective artworks will generously give you that experience without demanding in return that you fully understand where the artist is coming from. Kwade is Polish, the daughter of a cultural scientist and an art historian and conservator. Her father, she has said, did not read her fairytales at bedtime, but instead encouraged her to fall asleep with thoughts in her head of the endlessness of space. At age 19, Kwade moved to Berlin to study fine arts at the Universität der Künste and ended up staying. (The portrait wastaken in her studio in the Weissensee, a neighborhood in the northeast of Berlin). Though in her case, the idea of a home base is also an increasingly relative one. Before arriving in Ipswich Kwade had been in Rome, and she is currently working on projects in Denmark, Finland, the Netherlands, Spain and Russia, as well as one in nearby Boston. But it would seem that the resulting sense of dislocation is only fueling her work. TunnelTeller, 2018. © Alicja Kwade, courtesy of Peter Vanderwarker Photography.